A Prequel That Could Have Been Better. I am not a fan of the prequels at all, too much CGI and the cast was weak except for Ewan McGregor. I purchased this for a friend who like me is a big Star Wars fan. After the prequels came out I thought the franchise would be destroyed, but Episode 7 saved it. When I received the movie it came in great shape, and my friend was thrilled to receive it. Awesome Movie!! My 7 year old son LOVES it !!! 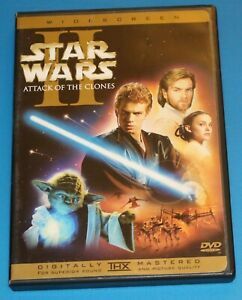 In the second installment of the Star Wars series, EPISODE II--ATTACK OF THE CLONES, Anakin Skywalker (Hayden Christensen) is now a teenage Jedi apprentice to Obi-Wan Kenobi (Ewan McGregor). Together they must protect Senator Padme Amidala (Natalie Portman) from a militant group of political activists that is trying to assassinate her. This group is led by the evil Count Dooku (Christopher Lee). Among other troubles, Anakin faces some hard choices as he begins to fall for Padme, knowing this love is forbidden by the Jedi knights' creed. In addition, Anakin begins to show his rebellious attraction to the dark side--which will eventually conquer him, when he becomes the future Darth Vader. The story is set 10 years after STAR WARS EPISODE I: THE PHANTOM MENACE, and there are appearances by some of PHANTOM's characters, including Jar Jar Binks. CLONES also brings back familiar faces from the original STAR WARS: the lovable droids R2D2 and C3PO, and Yoda, who plays a key role in this film. Lucas creates an impressive array of beautifully rendered alien planets and beings, sleek spaceships, and dazzling effects; he remains at the head of the class in terms of technical ability and visual imagination. The film's climactic final sequences show the magic with which CLONES' earns its place as part of the beloved STAR WARS series. My opinion of ''Attack of the Clones'' is mixed, at best. I have general admiration for some of the action sequences and special effects. The more traditional dramatic elements, such as character development and dialogue, especially with respect to the relationship between Padmé and Anakin are nothing short of laughable at points.As is typical of the films of George Lucas, the dialog is stiff and flat. The acting (particularly by Christensen and Portman) leaves much to be desired. One of the best things that can be said about the film is that Jar Jar Binks plays only a minor role. His awful attempts at comic relief seen in ''The Phantom Menace'' were toned down; instead, C-3PO reprised some of his bumbling traditions in that role. It is sad to think that is a chief selling point for this film. Taken as a whole, the film is barely worthy of the Star Wars legacy.